This is the last of a series of articles concerning the Gentry families that were living in the southeastern corner of England, in the 1500's and 1600's. The series was initiated by a desire to identify the source of the Gentrys who left England and moved to the American Colonies in the 17th century. A search of parish records has revealed the presence ofseveral families that lived in County Essex. One of these was a family descending from a John Gentry who was buried in Lindsell in October 1570, leaving a will dated that same year. Descendants and relatives of John continued to live in Lindsell but also spread to other neighboring communities, namely Great Dunmow, Witham, Kelvedon and eventually to London. This family shows the most promise of being the source of Nicholas and Samuel Gentry who emigrated to the British Colonies and settled in Virginia in the latter part of the 17th century. The family has been discussed in previous issues of the Gentry Journal at some length<1>. A second extended family descending from a William Gentry, who was probably related in some way to John, lived contemporaneously with John's family but was confined to the community of Bocking. Their family history is reported over a span of nine generations in a companion issue in the Gentry Journal<2>. 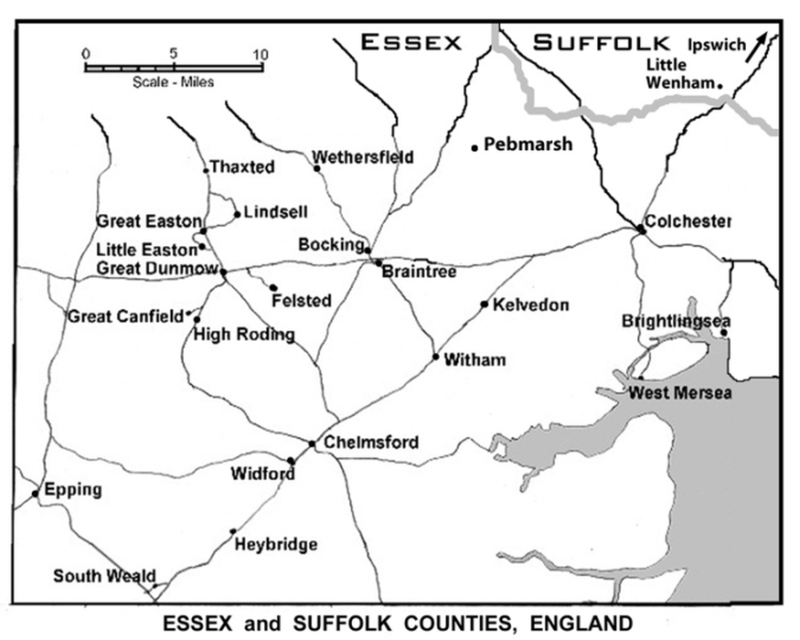 Other smaller family fragments of Gentrys have been found in Wethersfield, Great Canfield, Epping and a few other isolated communities in Essex, and in Little Wenham, Suffolk (see map below). The Gentrys in Little Wenham, in particular, may have been related to the family that lived in Bocking, based on the similarity of names. This family is a prime candidate as the source of a John Gentry who emigrated to Philadelphia at the turn of the century in 1700. To supplement the material that has already been published, we propose in this article to provide an overall summary of what we know about the Gentrys of Essex and Suffolk Counties. Records of births or baptisms, marriages, and burials in England were not kept until 1538. The Suffolk County [England] Record office has published (at <www.suffolk.gov.uk/sro>) a brief and succinct description of the early parish records that developed following the break of the Church of England from the Roman Catholic Church. "In 1538 Henry VIII's Vicar General, Thomas Cromwell, ordered the minister of each parish in England and Wales to keep written records of every baptism, marriage and burial at which he officiated. At first most entries were made on loose sheets of paper, many of which have been lost. "In 1597 it was ordered that from the following year each parish was to keep a book made of parchment. Earlier entries were to be copied into the new books, certainly entries since the accession of Elizabeth I in 1558. As it was not obligatory to go back to 1538, many registers begin in 1558. "In 1558 it was also ordered that a copy of all the events recorded during the past year should be made and sent to the Bishop. These were called Bishops' Transcripts. No standard form of entry was stipulated for parish registers until Hardwicke's Marriage Act 1753 and Rose's Act 1812 relating to baptisms and burials. "Until 1754 most registers are composite registers, that is each volume contains baptisms, marriages and burials, entered either in one mixed sequence or in three separate sequences in different sections of the same volume or, occasionally, in separate columns on the same page. Entries were generally written in chronological order but parchment was expensive so gaps were filled up with entries out of sequence, sometimes with a note to that effect (perhaps a finger pointing), sometimes not. The style of entry varies from place to place and over time. Often only the barest details are given." It should also be noted that during the time of Cromwell, until the return of Charles II in 1660, many parish rectors lost their jobs and many church records were either not entered or registers were lost. The first Gentry for whom a record has been found in the Essex/Suffolk area was a John Gentry who signed a deed in 1438, with others, as a donor of a croft <3> near Pebmarsh, Essex, midway between and north of Booking and Colchester. The next reference was to a Robert Jentry, husbandman, of Brightlingsea, Essex, who filed a will in 1546. Soon after, a marriage was recorded for an Alice Gentrie to John Reade in 1564 at Monks Eleigh, Suffolk. These two references are followed by references to individual Gentrys and to extended families of Gentrys who lived within about a twenty miles radius in eastern Essex and southern Suffolk Counties. These included the family of John Gentry of Lindsell, Essex, Henry Gentry of Wethersfield, Essex, the family of William Gentry of Bocking, Essex, the family of Joseph Gentry of Epping, Essex, and the family of John Gentry of Little Witham, Suffolk. In general, Gentrys have not been found living in other areas of England during the 1500's, but there certainly was a concentrated scattering of them in this southeast corner of England. With such a concentration of Gentrys in a relatively small area, it is probable that they were all related in some manner, perhaps several generations back. John of Lindsell and William of Bocking were of an age such that they could have belonged to the generation following that of Robert of Brightlingsea. Henry of Wethersfield, Joseph of Epping, and John of Little Witham appear to have been a generation younger than the older two. Whether any of them were directly related to Robert or not we cannot say but the re-occurrence of the name Robert in the Bocking and the Little Witham Gentrys suggest that perhaps those families, if not the others, were direct descendants of him. Moreover the very common occurrence of the name Henry in later generations of Bocking Gentrys suggest that Henry of Wethersfield was related to the Bocking Gentrys. Whereas John Gentry of Lindsell was a husbandman and worked the land, William Gentry and his descendants were mostly weavers. This raises the question, were they related in any way to the flood of refugee Huguenot weavers that poured into south-east England in the mid-sixteenth century? 1. As of this date, no indiviidual named Nicholas Gentry has been found in any of the Essex, Suffolk and London records studied. Consequently any possibility of identifying the family to which Nicholas belonged depends upon identifying his presumed older brother Samuel. 2. The name Samuel was a common one within the Lindsell Gentry family. One Samuel in particular, son of Nathaniel Gentry of Kelvedon has been proposed to be the most likely individual satisfying the requirements for Nicholas' brother. We observe further, that this particular family, while roughly centered around the town of Lindsell, spread over time to a number of neighboring communities including Kelvedon, Great Dunmow, Great Easton, Witham, and eventually London. In contrast to the Gentrys described above, there was a family of Gentrys that lived in the town of Bocking and remained there for generations. Initially this was probably a consequence of the fact that a number of them were weavers whose large, expensive looms would have been difficult to pick up and move to a new location. Of significance when considering them as possible antecedents of Nicholas Gentry of Virginia, is the fact that there were no Samuels among their number. This and the fact that they were bound essentially to a single location, rule them out as candidates. The continuity of the family and the wealth of information existing in the Bocking parish records provide an interesting view of the English merchant class families of the time and the family is described in depth in the separate issue of the Gentry Journal referenced above. Because of the probable very close association with the Bocking Gentrys of the Henry Gentry who died and left a will in Wethersfield in 1578, he is discussed in this same article. Parish records for Little Wenham describe a family descending from a John Gentry, with a pattern of names so similar to those of the Bocking Gentrys (e.g. William, John, Robert, Thomas), that one is led to consider the probability that the two families were closely related. If they were related, it could not have been by descent from William Gentry of Bocking who already had a son, John, but the father of the Little Wenham John could have been a brother of William. The patriarchal John Gentry of Little Wenham was of an age that paralleled the second generation of Lindsell and Bocking Gentrys. For ease of comparison, we will therefore label his generation accordingly in the following chart. All locations are in Little Wenham unless otherwise noted. – married (2) Thomasin Smith, 19 Jun 1599. John Sr. was buried 1618.
i John Gentry baptized 24 Nov 1594. 2 ii William Gentry baptized 17 Sep 1601.
iii Thomas Gentry baptized 29 Apr 1604. 3 iv Robert Gentry baptized 28 Dec 1607.
v John Gentry (2nd) baptized 12 Sep 1610 ; married Ann [--?--]; unnamed daughter buried Mar 1647. – baptized 17 Sep 1601. – married Ann Butcher, 1630, in Hadleigh, Suffolk (approximately five miles northwest of Little Wenham). i William Gentry baptized 13 Jul 1631.
ii Thomas Gentry baptized 1 Mar 1634/5; buried 1656.
iii (Speculation) John Gentry buried 1653.
iv Edward Gentry baptized 5 May 1639; buried 1657. – baptized 28 Dec 1607.
i Anne Gentry baptized 25 Jun 1637; married Nathaniel Balden, 1669. 4 ii Robert Gentry baptized 10 Mar 1638/9. iii John Gentry baptized 4 Apr 1641; buried 1674.
iv Thomasin Gentry baptized 1644; buried 1645.
v Thomasin Gentry (2nd) baptized 8 Sep 1645; buried 1646. A Robert Gentry who married Susan Gallant in 1637 at Stokes-by-Nayland (about six miles west of Little Wenham) could not have been this Robert, since this Robert's children continued to show Ann as their mother. Robert died late 1679 or early 1680, leaving a widow with unborn child. i Robert Gentry baptized 29 May 1662.
ii Elizabeth Gentry baptized 3 Apr 1664; married William Turner, 1682.
iii William Gentry baptized 20 Aug 1665; buried 1707.
iv Susanna Gentry baptized 23 Feb 1667/8. v Nathaniel Gentry baptized 20 Nov 1669.
vi John Gentry baptized 3 Dec 1671; buried 1691.
vii Daniel Gentry baptized 22 Nov 1673.
viii Ann Gentry baptized 12 Mar 1675/6. ix Thomasin Gentry baptized 1 Feb 1679/80 (daughter of Elizabeth, "relict" of Robert Gentry). The Little Wenham references shown above were all collected during the search for antecedents of Nicholas Gentry of Virginia commissioned by Mrs. Herbert R. Gentry in 1978 (see reference section below). Although parish records exist for the period from 1558 to 1900, only records up to 1680 were reported to Mrs. Gentry and are represented by the three generations of family records above. Unfortunately, none of the Little Wenham records have yet to be processed by the FreeREG project underway in Great Britain<4> . Although the Little Wenham Gentrys appear to not be the source of the Nicholas and Samuel Gentry who went to Virginia, they are prime candidates as being possible antecedents for a John Gentry who was living in Philadelphia in 1711. John is believed to be the father of a Robert Gentry, shipbuilder, who was living in Philadelphia late into the 1700's, and a John Gentry who was born about 1730 and lived in southern New Jersey. Robert had a son, Robert, and John had sons William and Thomas. The correspondence of names with those of the Little Wenham Gentrys in comparison to other Essex/Suffolk Gentrys strongly suggests that the former could have been the antecedents of the Philadelphia/New Jersey Gentrys. The cut-off in reporting of Little Wenham parish records does not allow clear identification of the John Gentry who lived in Philadelphia whose date of birth may have been just past the Little Wenham cut-off. One may hope that eventually these records will be made available online for searching in the British FreeREG project. A fragmentary family living in Great Canfield, not far from Lindsell, and originating with a William Gentry, possibly was closely related to John Gentry of Lindsell. In terms of age, William was a contemporary of John's children and he may have been a first cousin of them. This would imply that William's father may have been a brother of John Gentry. This fragmentary family has been described before in Issue A, 2006, of the Gentry Journal of Genealogy but is repeated here to provide a full listing of miscellaneaous Gentry families. All records were taken from the Great Canfield register, with the exception of the marriage of Joan Gentry and Robert Cabbidge. – married Joan Beade 28 Jul 1572, Great Canfield. 2 i Thomas Gentry baptized 14 Sep 1578.
ii Joan Gentry baptized 11 Feb 1582; married William Wood, 19 Oct 1600. – baptized 14 Sep 1578. – married Barbary [Barbara] Chander, 10 Jun 1601.
i Mary Gentry baptized 5 Nov 1601; married Thomas Taylor, 25 Feb 1624/5; buried 20 Jul 1635.
ii Joan Gentry baptized 3 Nov 1603; married Robert Cabbidge, 1629, in High Roding (located almost adjacent fo Great Canfield; recorded in "Boyd's Marriage Indexes, Essex"); buried 1 Jun 1630. Thomas was buried 17 Mar 1608/9. Both Mary and Joan's burial entries give their maiden names rather than their married names. As was mentioned in the earlier article, William's death relatively soon after his marriage suggests that he had no other surviving children than these two. The lack of male descendants explains why there were no further records for Gentrys in Great Canfield. Yet another family fragment, that of Joseph Gentry, recorded in Epping, Essex, may have been related to the Lindsell Gentrys. The fate of Thomas Gentry, son of John Gentry of Lindsell, is not known. He probably moved away from Lindsell but not so far but what he was included in his father's will in 1571 and that of his brother Richard in 1581. While there is no record of his children, based on the correspondence of name, one can speculate that Thomas was the grandfather of two other Gentrys, both of whom were married in South Weald, Essex (south of Epping). These were a Thomas Gentry, who married Elizabeth Turner in 1634, and a Richard Gentry, who married Sara Cole in 1635. Since South Weald is in the same direction from Lindsell as is Epping, it is possible that Joseph Gentry's father was related to Thomas and Richard and thus a possible grandchild of the older Thomas Gentry. – born about 1625 to 1630? – married (1) Elizabeth [Unknown]; died about 1667 to 1668? – married (2) Mary [Unknown]. The same Epping family appears in Essex Quarterly Sessions court records in which John (bricklayer), Thomas, and Joseph Gentry of Epping were cited in 1689 and 1690. The name Joseph is not particularly common among the early Essex Gentrys, but another Joseph was a son of Nathaniel Gentry of Kelvedon and there were a number of Josephs among the later generations of the Bocking Gentrys. In addition to the names described above, one can find a scattering of occurrences of the Gentry name in contemporary Essex and Suffolk county records. In the case of marriages of men, some may have involved men from one of the major families listed above who were married in a neighboring community to a spouse who lived in that community. In the case of women, the citation probably represents the presence of a Gentry family living in that parish. The number is not large, but sufficient to show that the name Gentry was not restricted to just a few families but included a scattering of Gentrys throughout the area. Instances dated prior to 1700 are listed below (see map above for location of most of these parishes). It is evident from the families described above that the name Gentry was far from unknown in Essex and Suffolk during the period of time from 1500 onward, in particular from about 1600 on. No one has found similar pockets of Gentrys in other parts of England, nor do we know of any such individuals living in much earlier years. This lends some credence to the proposition advanced by some that the first Gentrys came to England from the Continent, landing on the south-east coast of England, perhaps fleeing persecution as did the Huguenots in the 1500's. Mrs. Herbert R. Gentry, "The Hunt for the Missing Link: Research in England", Gentry Family Gazette and Genealogy Exchange, vol vi, p.151 (May 1987).